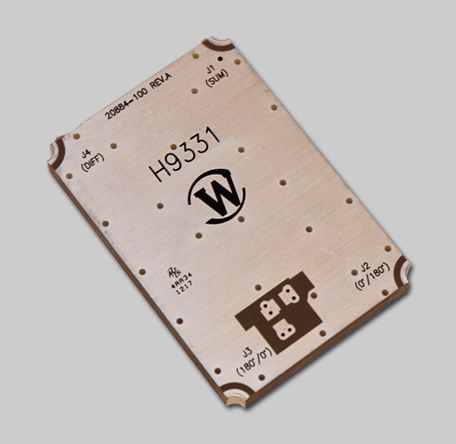 Werlatone's newest 180 Hybrid Combiner, is the non-connectorized Model H9331. This chemically bonded design covers the full 350-1000 MHz band, and is rated at 150 W CW. Measuruing just 1.8 x 2.6 x 0.28", the H9331 is suitable for Military and Commercial applications. A connectorized version is also available, Model H9395. Werlatone’s newest 180 Hybrid Combiner, is the non-connectorized Model H9331. This chemically bonded design covers the full 350-1000 MHz band, and is rated at 150 W CW. Measuruing just 1.8 x 2.6 x 0.28″, the H9331 is suitable for Military and Commercial applications. A connectorized version is also available, Model H9395.